Using such a prosaic material as the front pages of daily newspapers, Canadian paper artist Myriam Dion creates fabulous woirks of art. 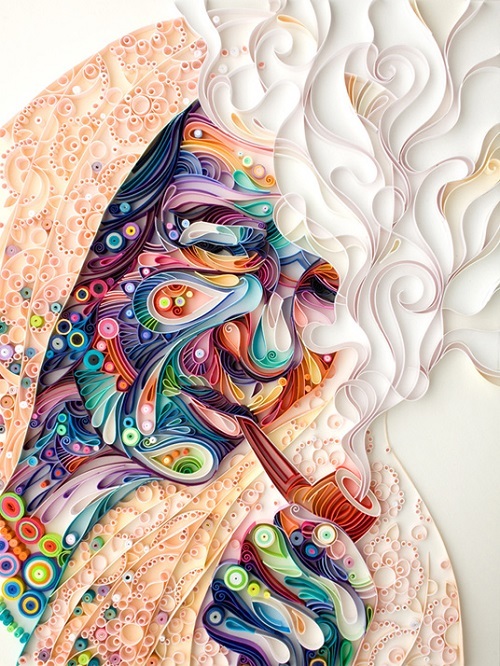 In particular, with the help of a sharp blade and imagination, she turns newspapers into the magic patterned fabrics. Miriam Dion graduated from the Department of Fine Arts and Design, University of Quebec with MA in Visual and Media Arts in 2014. Working with old editions of the newspapers «Financial Times», «The International Herald Tribune» and «Le Devoir», she carves out intricate paper resembling antique lace patterns. Fastened in the web that can cover an entire wall, the newspapers are similar to samples of complex design textiles. You probably have seen many examples of embroidered picture. 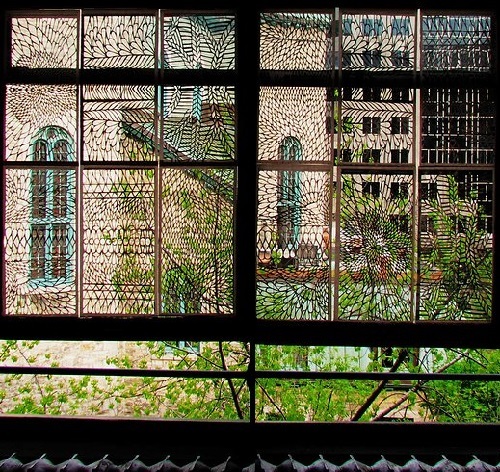 But the work of the Amsterdam based artist Hinke Schreuders will delight you (hopefully). 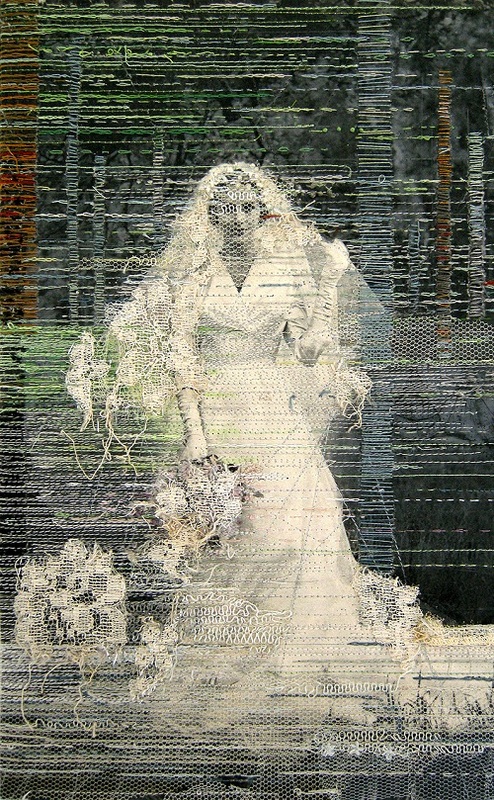 Dutch artist Hinke Schreuders makes a diverse layer of hand embroidery, beading, air lace weaving, and painting creating a completely new image, based on photos from her personal archive. Female figures – romantic, gentle, accentuating feminine fragility and vulnerability. This series of her work started ion 2008, is called simply: “Work on paper”, every work has a number instead of title. The artist neither explains the viewer the subject, nor tells the idea. See, define yourself. Hinke Schreuders was born 1 December 1969. Embroidery on paper artworks by Hinke Schreuders have been exhibited in galleries and museums both in the Netherlands and Europe. 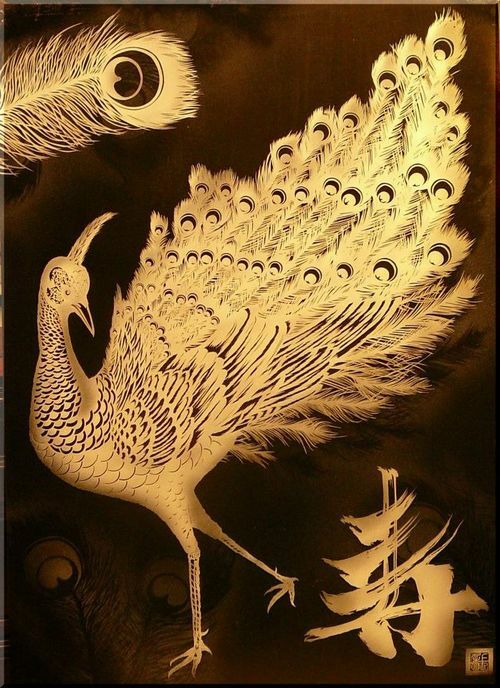 American self-taught paper artist Maude White has created an art gallery of intricate paper cut of fairy characters, birds, animals. Maude White came from a family of visual storytellers. 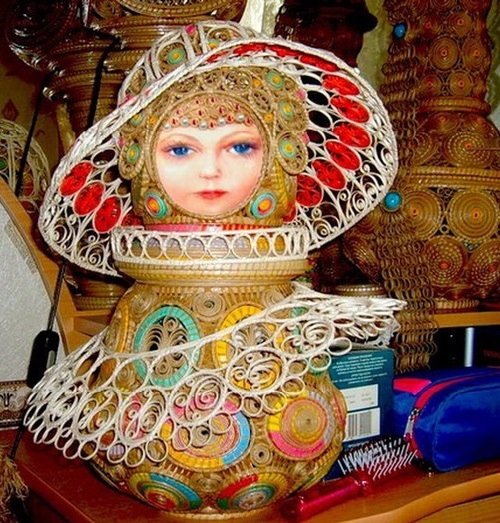 Her mother and sister are both gifted toy makers. Maude White is influenced by her family art. When she was little she enjoyed working with paper. She was attracted by the stark contrast between the black and white paper. 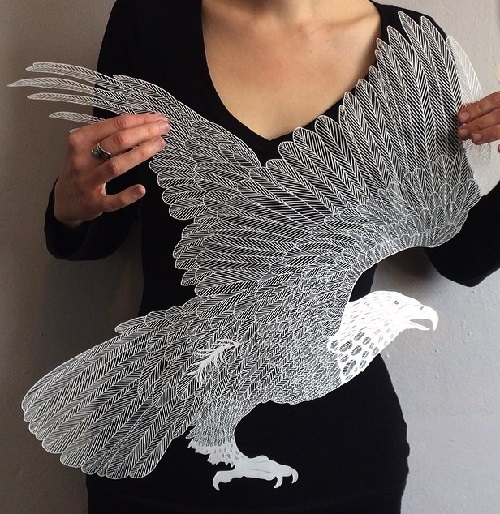 “With paper cutting there are so many opportunities to create negative space that tells its own story, just by letting the observer become present in the piece, by allowing him or her to look through it. I like that.” Maude White is currently working on an exhibition to be shown in Buffalo, NY in September.